There is just something special about a homemade gift, especially when it is something the receiver can really use and love. A few Christmas’s ago we did a totally homemade Christmas (minus candy and a few of our favorite new movies). It was really fun to get creative and help cut costs. And the toys we made for the kids are still used and loved today. 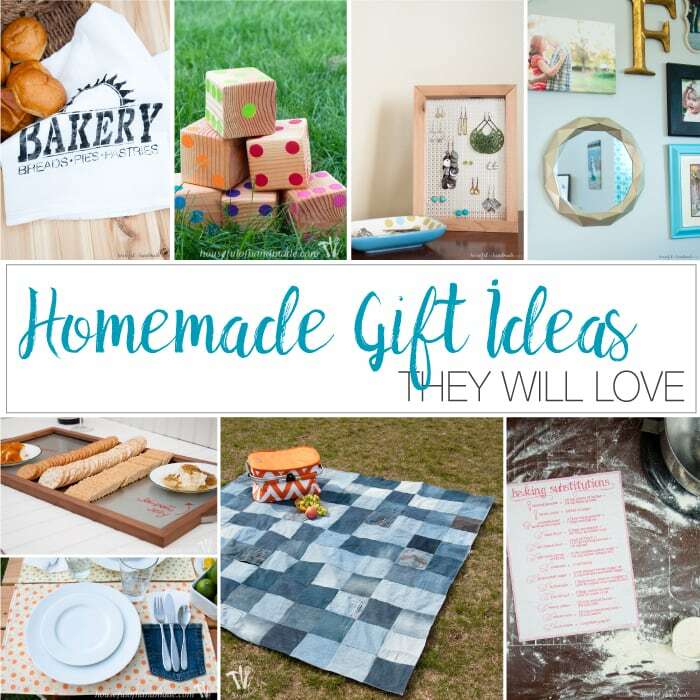 So if you want to give something extra special this year, I have compiled a few of my favorite DIYs for these great homemade gift ideas. If you have anyone on your list that love home decor, this Anthropologie knock-off mirror is the perfect gift. This DIY cost about $10-$15 because you will need to buy a mirror (I used a 40% off coupon at Hobby Lobby) and a can of spray paint if you don’t have a ton of it lying around. 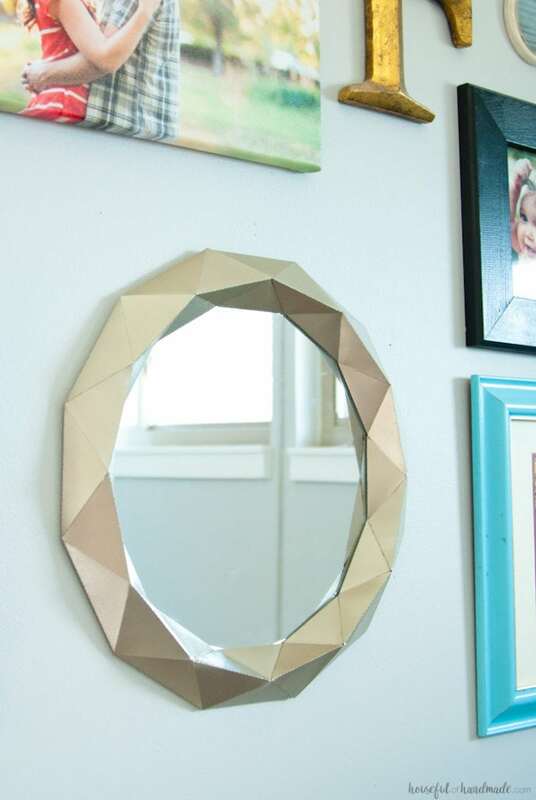 But you’ll never guess that the actual mirror frame is made out of paper and hot glue! Yep, you read that right. Cardstock looks surprising expensive when covered in spray paint. For the fashionable lady (or girl) on your list, this easy earring stand its a beautiful way for them to store and display all their jewels. 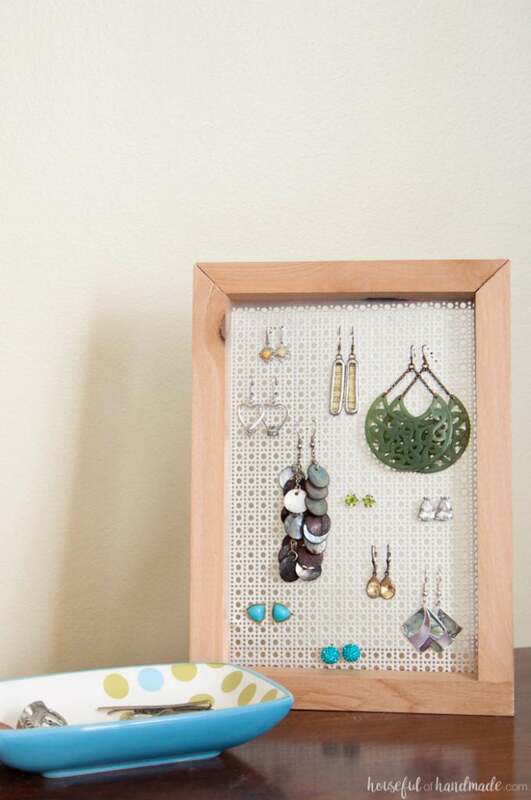 This earring stand is easy to make with a couple small pieces of wood and some decorative aluminum sheeting. I made one for myself and one for my 4 yr old daughter and they are working beautifully for both of us! And for an extra bonus, add a new pair of earring before you wrap it. 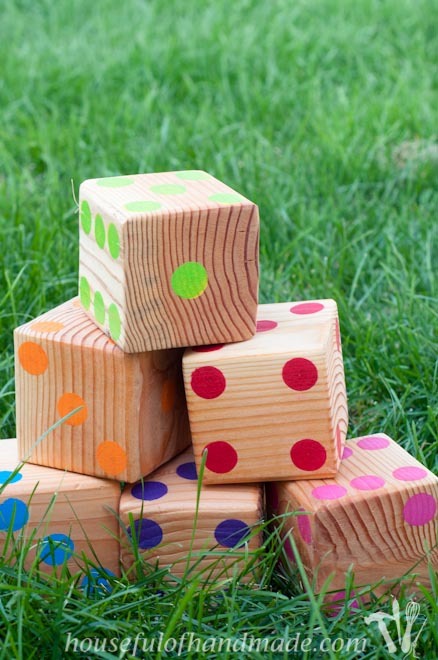 Our family loves to play games, and these colorful yard dice have become a family favorite. They are perfect for family game night, or to just let the kids be creative and invent their own games. You need about 24″ of a 4×4 to make a set of 6, so buy an 8′ board and make 4 sets. Now you can quickly cross 4 people off your list! One of my most popular posts is this water-resistant picnic blanket. I made it out of old jeans my husband and I were getting rid of. Because I was upcycling old jeans, the total cost to make this picnic blanket was less than $10. Our family has put this picnic blanket to good use, we use it for camping, trips to the lake, park days, water parks, 4th of July fireworks, and everything in between. 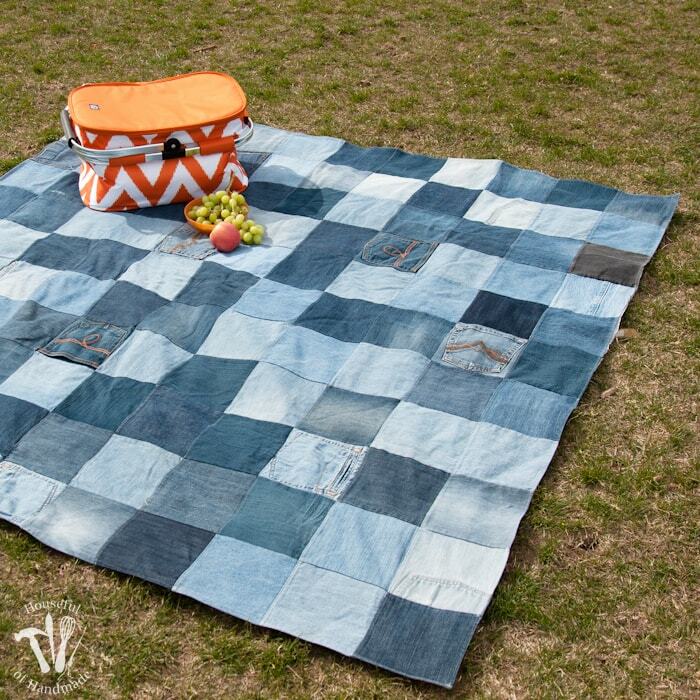 And we have been using the same denim picnic blanket for 4 years now and it looks just as good as it did the day I made it. Anyone with a family or who likes to explore in nature will be able to get a lot of use out of this great homemade gift idea! If you have a few extra jeans pockets after making a picnic blanket, these picnic placemats have a pocket to keep your napkin from blowing away. These placemats are quick tosses together with just a couple yards of coordinating fabric. Make one for each member of the family so they will be ready for lots of family picnics and fun. Who doesn’t need picture frame (or two)? 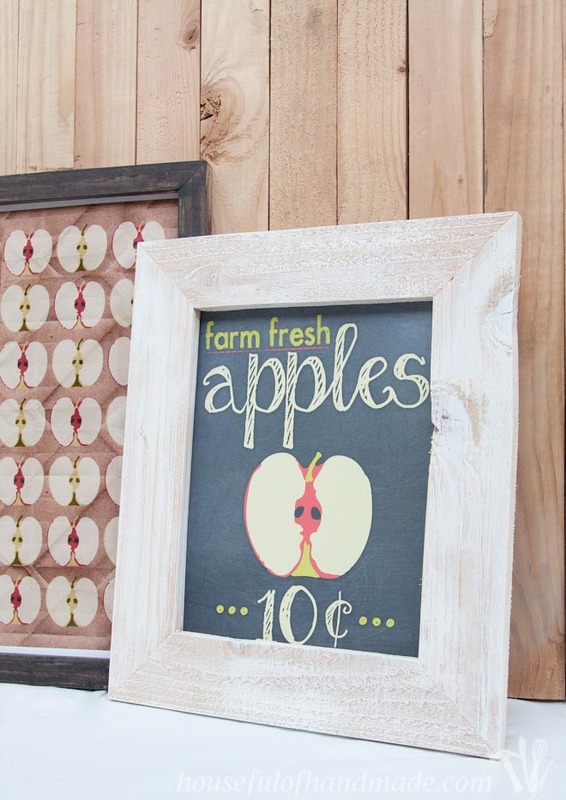 You can make a rustic picture frame with a few simple tools and about 20 minutes. Depending on the size, you can even make one out of scrap wood. If you don’t have a miter saw, you can always use a hand saw and miter box to make perfect corners. And for bonus points, fill the the frame with a fun photo or piece of art! 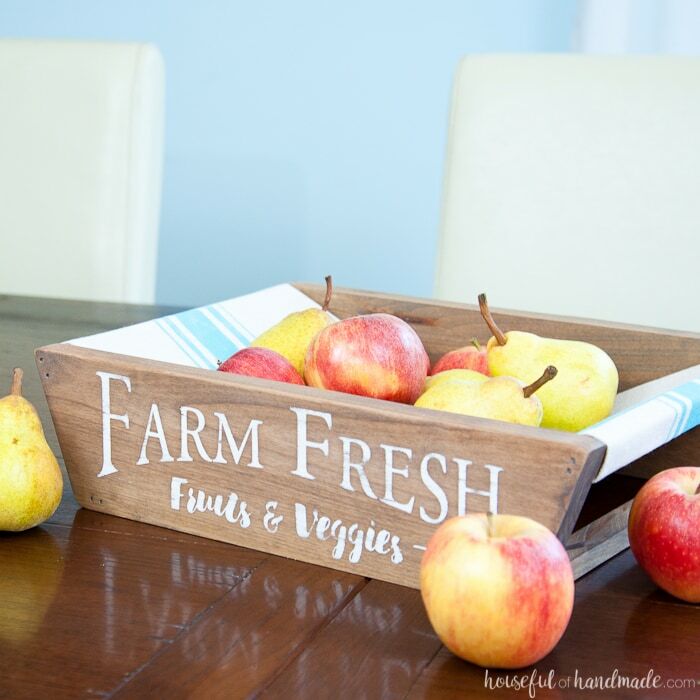 When I made this farmhouse produce basket, I had to fight off 4 people that weekend who tried to take it home with them! Seriously, they were all so in love with it when they came to visit that I had to check their bags before they left. So instead of fighting them off, I guess I just need to make a bunch to spread the love. This project takes a little more time because you have to wait for the paint to dry (and there are a few steps of painting), but fill it with some Christmas fruit and your receiver will love it! 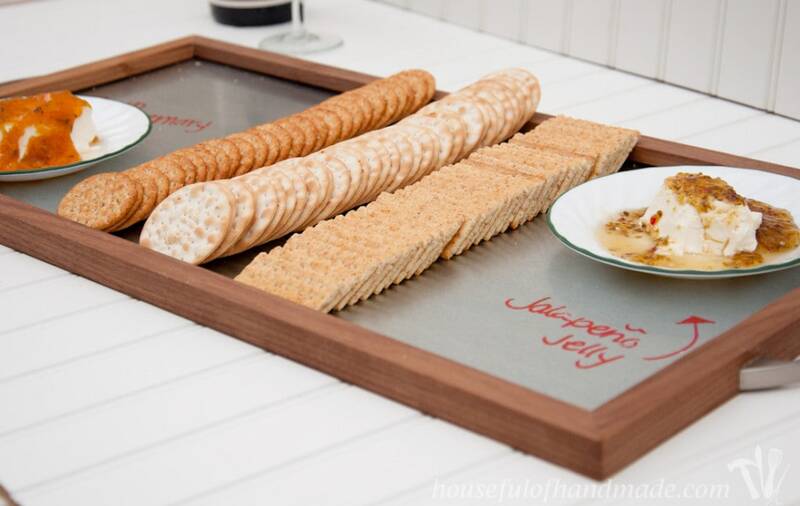 For the entertainer on your gift list, why not make them this wood & steel serving tray. I used walnut to make my tray so it cost about $20 total to make, but you can use a less expensive wood to save a few bucks. This tray has come in really handy, I’ve turned it into a sign for our coffee station and as a base for a fall centerpiece as well as using it as a tray. I love that you can write on the galvanized steel with a whiteboard marker so you can label all your goodies. 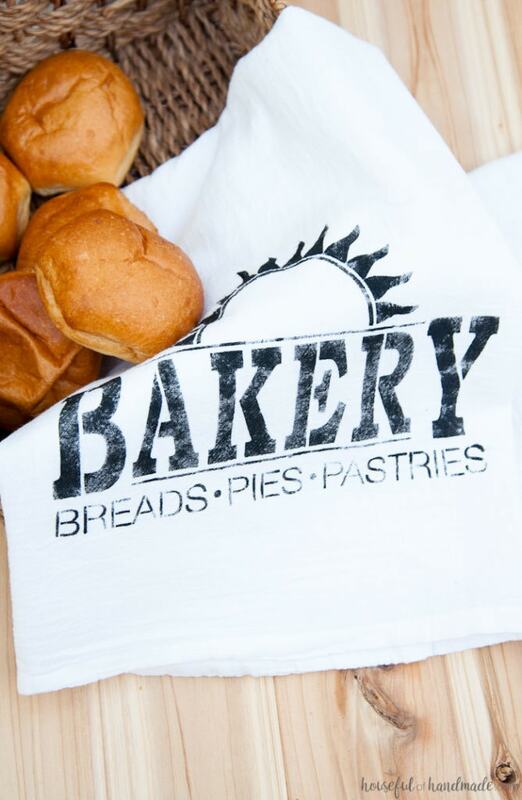 If you need a gift for a baker or chef, why not make them a personalized set of tea towels. I purchased a set of 4 cotton tea towels for $5 and turned them into these vintage inspired bakery tea towels. They would be perfect in a basket with a couple baking mixes, or even goodies from your favorite bakery. And every time they use your homemade tea towels they will remember your wonderful gift. 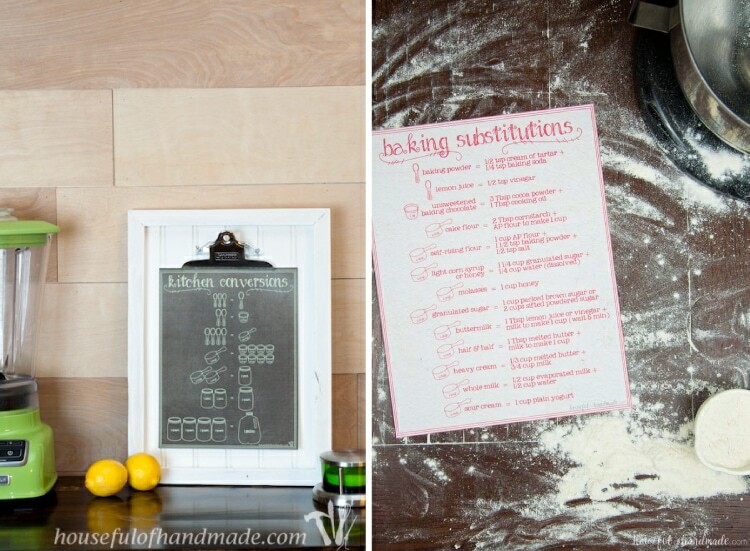 Another great gift for the cook in your life are these printable kitchen conversion chart and printable baking substitutions chart. Print and laminate them so they can withstand lots of use in the kitchen. Then pair them with your favorite kitchen gadget or cookbook and maybe they will invite you over for dinner to show their gratitude. I hope I have inspired you to make some wonderful homemade gifts this Christmas, or really for any time of year. These ideas would be perfect for Mother’s Day, birthdays and more! I’d love to hear if you have any other wonderful homemade gift ideas, the more the merrier! Thank you for sharing your creativeness, I’m truly grateful. 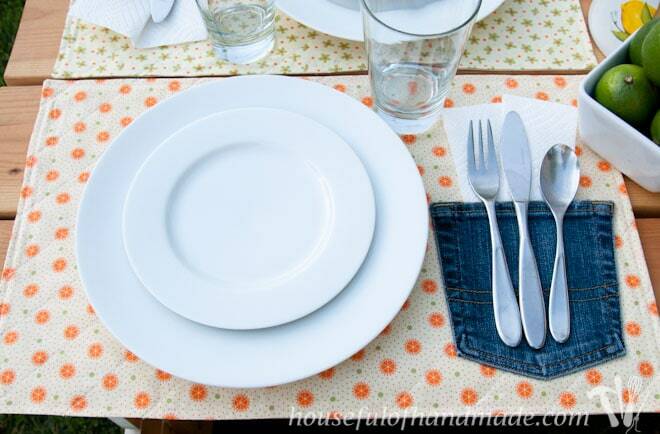 How do I get the instructions for the upcycled Jean picnic blanket? I think it’s beautiful. I can’t figure out how to get to the instructions. I’m kinda new at learning this computer stuff still. There should be a link to the tutorial in the post (the underlined words are links that will take you to another post). But just in case here is the link for you: https://housefulofhandmade.com/easy-water-resistant-upcycled-jeans-picnic-blanket/. Sign me up for most (ok, all) of these!) Love all of them! Thanks for joining #MerryMonday! Nice collection of ideas and so pretty! Great ideas – love the large dice! Thanks Roseann. The large dice are so much fun!